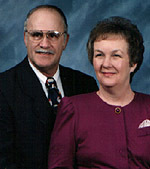 Missions Alive was started by Harvey and LeAnn Waddelow in April, 1983. Both Harvey and LeAnn are graduates of Lincoln Christian College. They served with African Christian Mission in Zaire, Africa for 13 years. Harvey was President of the National Missionary Convention in 1983. Harvey has been in over 40 different countries assisting missionaries and preaching the gospel. Seeing the need to recruit and train additional missionaries for overseas work, the Waddelows formed Missions Alive. They understand the needs and difficulties of missionaries and are uniquely qualified to assist them in their ministries. Missions Alive exists to motivate, educate, recruit, and equip churches and individuals for worldwide Christian missionary service. THAT GOD is not only the omnipotent, omniscient and omnipresent Creator of the universe, but also the loving Father, Provider of all life, and righteous Judge. THAT THE BIBLE is God's divinely inspired revelation to man. These Holy Scriptures are not to be added to, nor subtracted from, by anyone. THAT JESUS is the Christ, the Son of God, who came to earth in the fullness of time, as Savior and as Messiah. This same Jesus is recognized as the only begotten Son of God, born of the virgin Mary, crucified on the cross after a sinless life on earth, raised bodily as Lord from the tomb, ascended into heaven as King of Kings, and is coming again to reclaim those who are His own. THAT THE CHURCH is the divine institution by which God has provided for the preaching of the Gospel and the salvation of the world. This Church, the Body of Christ, has divinely given ordinances, which are Christian baptism, the immersion of the penitent believer for the remission of sins, and the gift of the Holy Spirit; and the Lord's Supper, observed weekly in the remembrance of Him. We insist on saturating our daily ministry with prayer as we follow Biblical Principles and the directive to "Pray without ceasing." We insist on the highest level of integrity among members of our organization in all matters both corporate and individual. We insist on sensitivity and responsiveness in meeting the needs of the individuals and organizations that we serve through a Christ-like attitude of serving, giving, and caring. We insist on creative excellence which demonstrates meaningful, carefully designed and crafted products and services that stress genuine value. Mike, a veteran missionary of 27 years, is assisting Missions Alive during his extended leave from Thailand. Because of his kidney disease, he is in America on Dialysis three days a week, and waiting a kidney transplant. His wife and two sons are here with him. He plans to return to Thailand once he can get that transplant. He has an adopted daughter still in Thailand staying with his wife's relatives.